An edgebander in production at the Oshkosh Door Company in Oshkosh, WI. With more than 150 years in the industry, Oshkosh Door Co. has done it all. The Oshkosh, WI-based architectural door company specializes in LEED- and FSC-certified products, as well as CARB-compliant doors. According to Gene Miels, president and COO, what sets the company apart from many competitors is its quick turnaround. In one shift, the company can produce 2,000 to 2,500 doors per week. "We're a very lean operation and can pull product through quickly," said David Johnson, controller. The company uses Friedman’s ERP software along with bar coding to track inventory and work in process. Oshkosh Door uses an automated core assembly, sanding and hot press line to produce five-ply architectural flush, prefit and beveled doors. Inside the 110,000-square-foot plant is a Wild core line, at which the panel is cut to size and stiles and rails are glued using Franklin Doorbond. The surface is sanded on a Timesavers and prepped for pressing. At the Wild press line, which the company installed in 2001, panels are fed into a Black Bros. glue spreader, which applies Franklin PVA onto two sides. From there, they are sent to a five-opening hot platen press, after which they are automatically transferred to the Stefani trim saw/edgebander stations, which the company installed in 2005. The sizer scans the barcode and automatically adjusts to the correct width, bevel and length while selecting the specified edgebanding. Oshkosh door also has a Stefani double-sided edgebander for additional processing and capabilities. The company offers full machining capabilities, and has a three-axis and five-axis machining center, including an SCM Routech, which it installed in 2006. Prior to finishing, parts are sanded and inspected on the Heesemann sander. "We have quality control at every phase," said Miels. Oshkosh Doors has a reputation for the quality of its products, including the finish. The company uses a fully automatic Sorbini/Cefla water-based/UV line to finish approximately 350 to 450 doors per shift. “Each pass is seven minutes, and they go through the line two times," Miels explained. Approximately 60 percent of the doors produced are stained, and the remaining 40 percent receive a clearcoat finish. The company does its stain mixing in-house. 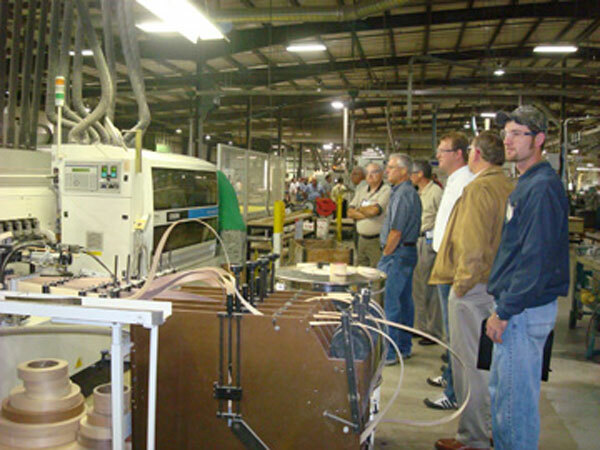 Watch this video of the trim/bander line.